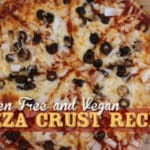 The Best Gluten Free Pizza Crust Recipe - Vegan! I remember my mom taking us every Friday after school to the local VHS rental store (remember those?) to pick out a movie to rent. It was cleverly located next door to the Take-n-Bake pizza shop where we always bought a large cheese pizza to go with our movie. 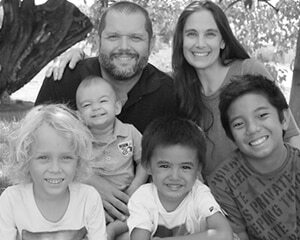 We didn’t realize it then, but the tradition of a Family Pizza & Movie Night was something far more significant than the food or movie – It was the time we spent together as a family that made it so special. Pizza & Movie Night still happens every Saturday night at our house. It’s something we all look forward to – minus the drive to the VHS store of course. The challenge these days is making sure everyone can eat it! 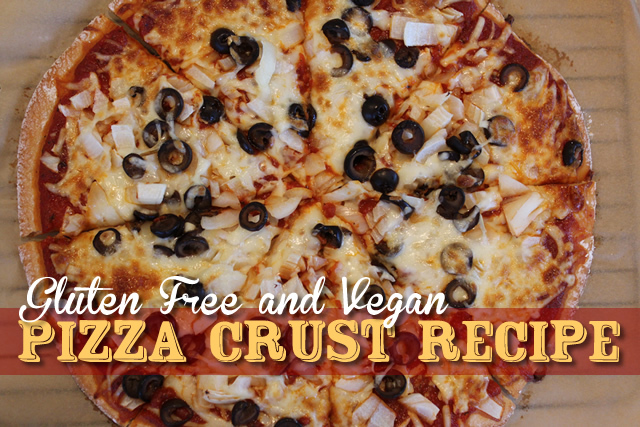 I came up with a Gluten Free AND Vegan Pizza Crust that always turns out great… It has a perfectly soft & chewy crust that holds up under the sauce and toppings. I hope you’ll be able to enjoy it with your family too! Want a quick & delicious Gluten Free, Vegan Pizza Sauce? Click Here for my 5 Minute Recipe! If you’re looking for the Perfect Pizza Crust Recipe made with Regular Wheat, then I have a recipe for that over here… I make it often for visiting family & friends. 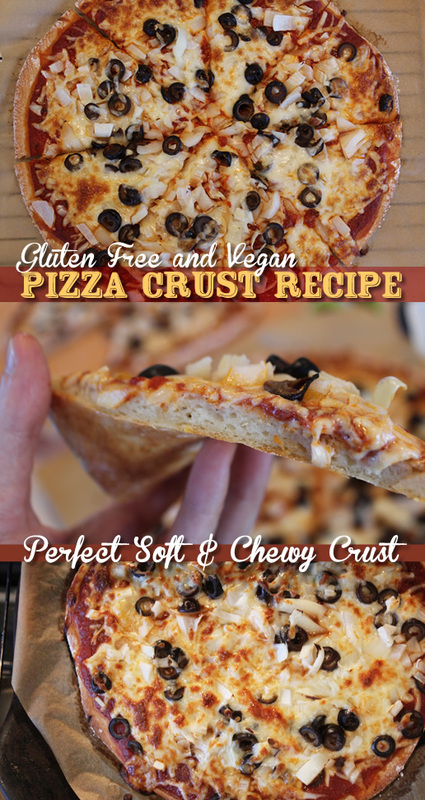 This is the BEST Gluten Free AND Vegan Pizza Crust Recipe that always turns out great… It has a perfectly soft & chewy crust that holds up under the sauce and toppings. Extra Tapioca Starch or Cornstarch for dusting hands & rolling out dough. 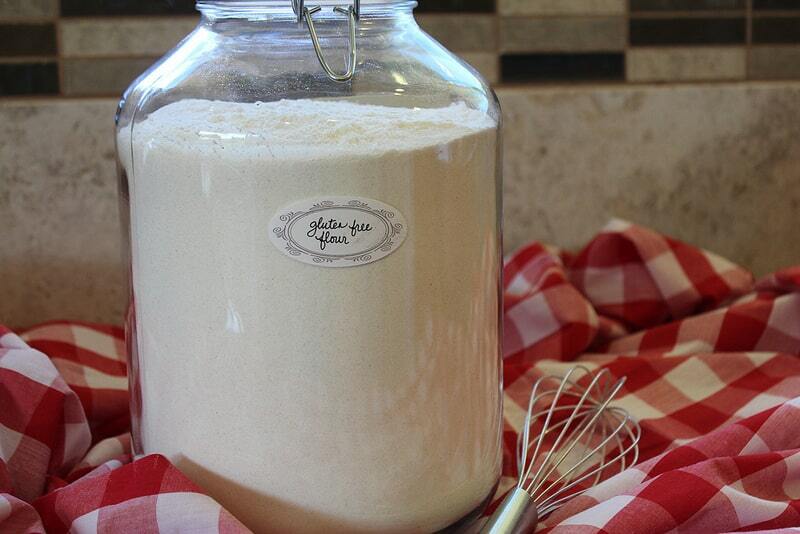 Finely Ground Cornmeal for dusting the bottom of your crust. In bowl of Stand Mixer, add Yeast Mix Ingredients in the order listed. Start with the warm water and stir in the honey, then gently add your Dry Active Yeast. Set-Aside to proof for approximately 10 minutes while you prepare you other ingredients & work surface. Whisk all of the Dry Ingredients into a small bowl. On a cutting board, layout 2 large squares of Parchment Paper and dust bottom of paper with a little Tapioca Starch & Cornmeal – then set aside. When yeast is done proofing, add your dry ingredients to the stand mixer bowl. 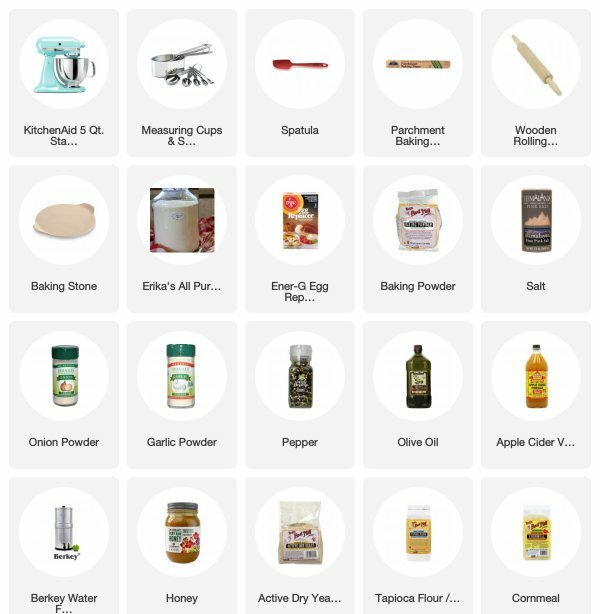 Using the paddle attachment, mix all ingredients on a Low-Medium speed until roughly blended… With the machine running, drizzle in your Wet Ingredients starting with the Olive Oil and then the Apple Cider Vinegar. Mix on Medium-High Speed for approximately 2 minutes until dough is completely blended. It will be very loose & sticky. Use a spatula to divide the dough into 2 separate mounds on the two parchment papers – Dough will be very sticky! Dust your hands and the dough surface generously as you shape the mounds into two disks. Using your dusted rolling pin, gently roll out the pizza dough evenly until the dough is approximately 1/4″ – 1/2″ thick. Preheat oven and Baking Stone to 400 degrees. Allow the crusts to proof for approximately 20 minutes while your oven is pre-heating. While the crusts are proofing, prepare your sauce and topping ingredients – but do NOT top the pizza crust until AFTER the crust has been Pre-Baked. Remove crust from oven and top with your sauce and toppings. 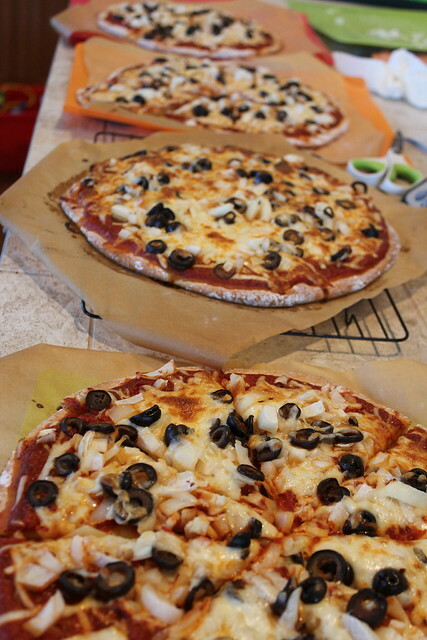 Return Pizza to baking stone and bake an additional 10-15 minutes until cheese is melted and crust is browned. 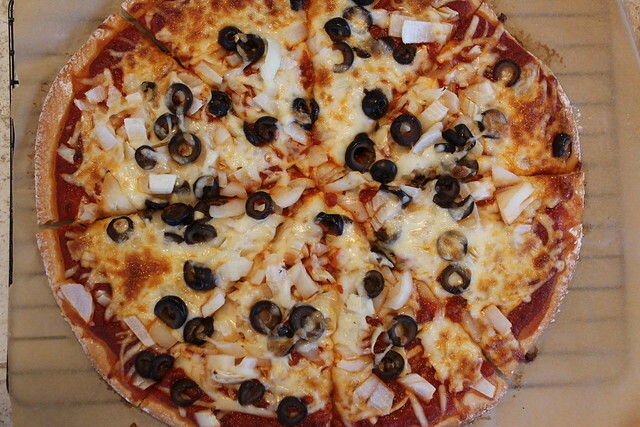 Remove Pizza from oven and allow to cool for 5-10 minutes before slicing & eating. You may have to take turns baking the crusts if you only have one stone. I typically bake the second crust while preparing the pre-baked one with my sauce and toppings. You can pre-bake your crusts ahead of time and store them in the fridge or freezer until you are ready to top & bake them. I’ve experimented with several types of pizza pans and hands down, a baking stone lined with parchment paper makes the best crust! See how the crust turns out crispy and chewy on the bottom, but light and soft on the top… Not soggy or doughy, but just right! 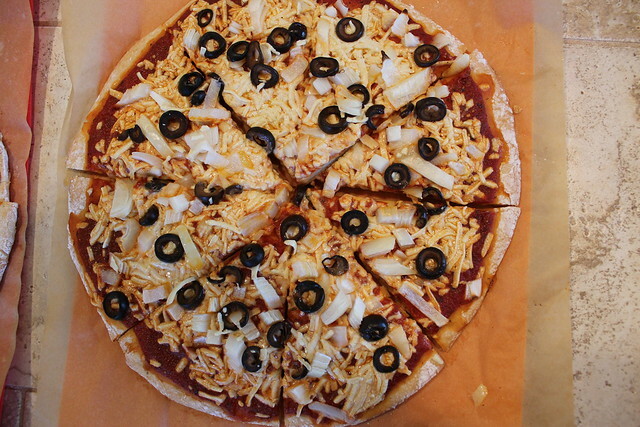 Pick out a good movie & you’re all set for Pizza & Movie Night! P.S. 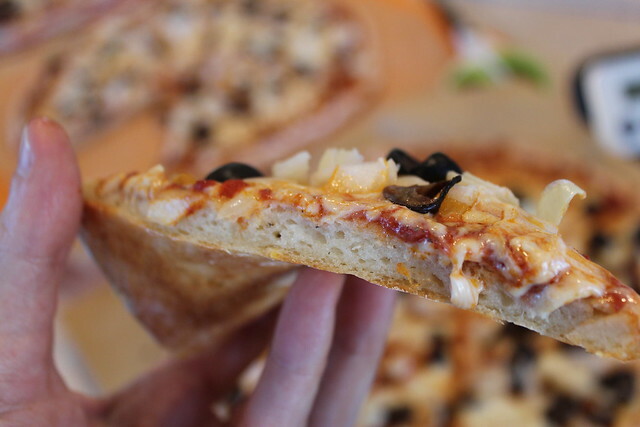 I use scissors to cut my pizza into slices… it works great! « Vegan Meringue Recipe – Made with Chickpea Brine! I need to make another batch of your flour first, but I can’t wait to try this! 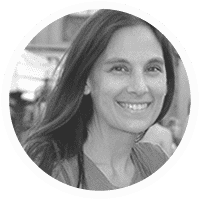 Thank you for sharing all of your yummy recipes with us! I can’t wait to try this! 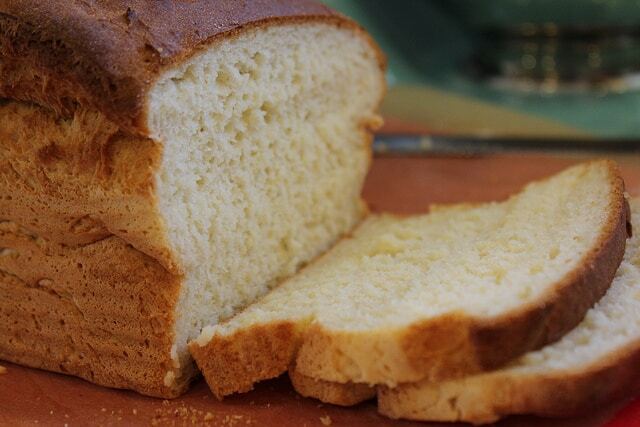 I make your flat bread and it is the best gluten free “bread” that I have ever made or tried! I’m wondering if I can use real egg whites instead of a replacer and if so, how many? Thanks so much for posting these amazing recipes. Did your crust come out good with real eggs? Please answer my question on your pizza!! Can the pizza dough be frozen and for how long? We don’t use corn in our recipes. What do you recommend as a replacement of the corn meal? Thank you for all of your recipes. We (my 10 yo daughter and I) enjoy coming to your sight to try new-to-us ones. I would love a vitamix when our budget allows!! Omg, made the pizza tonight and it’s AMAZING, just like my mom’s. Mom would make dough on Saturday nights and let it rise while we were in church, we always stopped to rent a movie on the way home too. Can it be put in freezer? Hi, do you think this dough recipe would hold up to making individual hot pockets? I have to go GF and was wondering how I could make this recipe using real eggs instead of a substitute as listed in the original recipe. You mentioned to another poster to perhaps use 2 egg whites. Could you please try this with real eggs and let us know your results? I am wanting to try it but don’t know enough myself to experiment yet. Thanks. Hi, Ericka has another gf pizza crust recipe that is not vegan and uses eggs. I have made but and actually prefer the vegan one, it has a great flavor with the onion and garlic. My egg replacer requires it to be mixed with water. Should I add it to the stand mix before adding the dry mixture? I used Neat Egg, and just mixed it in with the dry ingredients. I’ve done this with other of Erika’s recipes, too, and they have all turned out well. Can this be made with a hand mixer? Can this be made with a flax seed egg? I am also allergic to potato starch and can’t use the egg replacer. If I were to use real eggs, would you recommend 1 or 2 eggs in the recipe? I love your sandwich bread and I can’t wait to try the pizza crust! Winner! 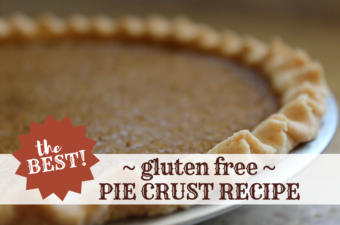 I’ve tried so many supposed gluten free pizza crust recipes and even bought an expensive pre-mix bag from the store – this is the only one that actually tasted good. Even my picky mother-in-law tried it and she went in for thirds! Thanks for sharing. Any thoughts on subbing the Energ G with aquafaba? Just made your pizza crust recipe. The flavor was great! I did not use the egg replacer–just didn’t put it in. I didn’t roll out the dough, but patted it out to about 1/4 – 1/2 inch thickness. Baked it the 10 minutes, put the sauce and cheese on it and back into the oven for another 10 and let it rest for 10. The dough was not baked through. :( Do you think that may be caused by not using the egg replacer? I’m thinking next time, I just bake it longer for the first round. What are your thoughts? Thanks for your feedback. I have been using King Arthur’s all-purpose flour (the gluten-free one of course). Can I use this instead of your “blend” and get the same results? Just curious. I love your site. I have Celiac and even though my family doesn’t, I always make our pizzas and cookies GF. (Hey, mom wants some too! LoL!) Also, I just started following you on Pinterest, so I can’t wait to see what’s in store for my family there. Thanks again! Thank you for this recipe! It was delicious, so light and tasty with the seasonings in the crust. I too wanted to use real eggs and skip the replacer. What I did was put one egg in my liquid measuring cup and then added water to fill it up to the 1 1/2 cup mark. This worked great. 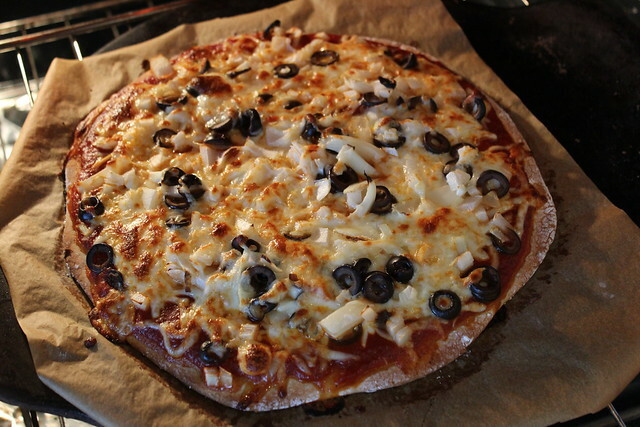 We topped our pizza with 10 minute mozzarella from The Lazy Vegan blog. We’ll definitely be making this again for the gf df people in our family. THIS turned out great! I’m so happy to have a pizza crust my son can have. I used an egg instead of the replacer and it worked well.